A poster of a sad-eyed girl studying in a dusty classroom is displayed next to a table of colourful handicraft in a quiet corner of a shopping mall. The salesman plays on your sympathy and tells you that proceeds of each sale supports the education of poor children in a third-world country. Some local businesses shun these methods and are choosing not to brandish their social objectives, focusing instead on building their products first. Case in point is local designer-jeweller Eden + Elie. Started two years ago, the business sells intricately handcrafted beaded necklaces and bracelets online and at shops in Orchard Road and the Singapore Botanic Gardens.. The firm works with individuals with autism from the Employability and Employment Centre and partners Daughters of Tomorrow to employ under-privileged women who need flexible home-based work. But that information isn't advertised prominently on the brand's sleek website. Founder Stephanie Choo told The New Paper she chose not to mention the company's social mission in its first year because they wanted to test demand, and to concentrate on issues like design and brand-building. Ms Choo, who is in her 40s, said: "The product has to work in order for the enterprise to be sustainable (whether or not there is a social component). "We (also) had a very small group of artisans, and I felt if it worked, then we would be able to scale up our hiring, partner organisations serving in these communities and then be able to share the story." Businesses like Eden+Elie were featured at the FestivalForGood, which was organised by the Singapore Centre for Social Enterprise (raiSE) and attracted a young, hip crowd of 5,500 two Saturdays ago. The 70 businesses at the festival represented the diverse, booming social enterprise landscape in Singapore. Think high-quality vintage leather bags crafted by impoverished Indian artisans, world-class speciality barista training that also supports disadvantaged women in Singapore as well as a technology platform that matches healthcare professionals to family caregivers. Social enterprises are not charities nor pure profit-making businesses. Instead, they typically channel a part of their profit to a social cause. The number of local social enterprises is also rising, against the background of higher business closures this year. 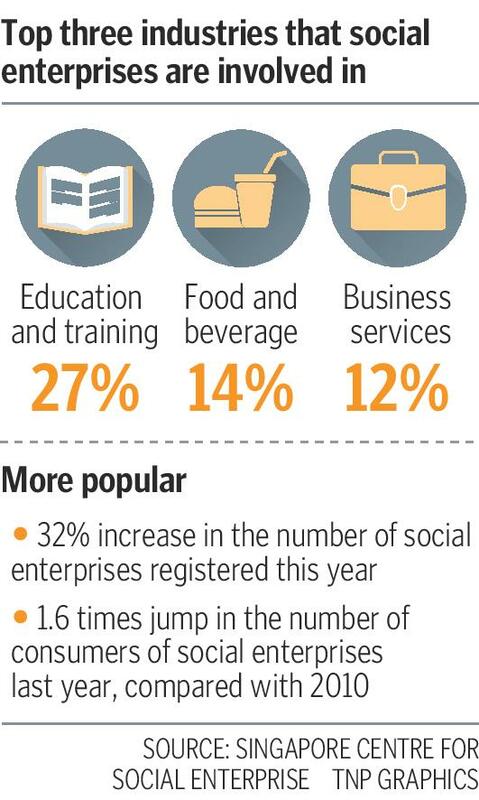 Figures from raiSE showed a 32 per cent year-on-year growth in the number of social enterprises registered this year. The organisation, set up in 2015 to develop the social enterprise sector in Singapore, has more than 400 members. In 2016, there were 303 members. By raiSE's definition, a social enterprise is a business entity that is set up with strong social goals and management attention is devoted to achieving its social goals. In Singapore, these businesses have generated some buzz in recent years. A raiSE-commissioned study last year showed that there was a five-fold jump in awareness of social enterprises between 2010 and 2016, with recognition highest among the 31-35 age group. Well-known local success stories include chef and ex-convict Benny Se Teo of Western restaurant chain Eighteen Chefs, which hires ex-offenders and troubled youths. Started in 2007, Eighteen Chefs now has 13 outlets islandwide. Another "veteran" in the relatively young scene is former web consultant Pamela Chng of Bettr Barista, a training academy which started in 2011. Over the past 5½ years, it has trained more than 3,200 people, and close to 70 women and youth-at-risk have benefited from its holistic programmes. It started with a founding team of two, and now has 30 staff members. But there has also been notable cases of failure, especially in the food and beverage industry. In 2013, Singapore's first social enterprise hawker centre, Kampung@Simpang Bedok, was forced to shut after just one year because of poor business, with vendors blaming location and a lack of quality food for the closure. Social enterprise Best Of Asia, which ran the hawker centre, had aimed to employ people such as ex-drug addicts, ex-convicts and the disabled. They eventually lost their $1 million investment, reported The Straits Times. Mr Jonathan Chang, executive director of the Lien Centre for Social Innovation, credits "enthusiastic support" from different sectors for the thriving social enterprise scene, but thinks growing social consciousness among consumers also plays a role. "Social enterprises also tap into a new vision for business that many consumers find more and more appealing. It's about expecting businesses to have a purpose that's greater than just turning a quick profit - expecting businesses, too, to do their part to create a thriving society." Mr Alfie Othman, chief executive officer of raiSE, highlights the trend of millennials who want to do good in their daily lives and are driven by greater social awareness, a sense of purpose and meaning. "The social enterprise ecosystem offers a natural outlet for these young people to pursue their passion and engage in meaningful activities that contribute to the economy and society at large. Another very real and practical reason is that there is greater support available for budding social entrepreneurs, through organisations like raiSE," added Mr Alfie. Indeed, Government and corporate support is growing. In raiSE's last financial year, a total of $6.6 million was committed to social enterprises in grants and investments. Since 2012, local bank DBS has supported more than 100 social enterprises in Asia with grant funding, from prototyping to scaling grants. Bettr Barista received a grant from DBS Foundation in 2015. Social enterprise Project Nomad, which sells leather bags made by artisans from a village in Jaisalmer, India, won seed funding last year after being named a finalist at the Singapore International Foundation's Young Social Entrepreneurs Pitching for Change competition. Over eight months, they were equipped with business know-how, shared ideas and heard from experienced social entrepreneurs about their challenges. The business was co-founded by two cousins, Mr Haziq Rashid, 24, and Mr Nasrul Rohmat, 26. Proceeds from each bag sold support a school in Jaisalmer, helping to provide education for underprivileged children in the community. Mr Haziq said he benefited from the guidance and added: "It is crazy to run a business, but even crazier to run a business with social impact as we are responsible to our beneficiaries and customers. "The enterprise element is our core because if we are not sustainable, we would not be able to help our beneficiaries in the long term." Mr Jonathan Chang, executive director of the Lien Centre for Social Innovation, has simple advice for social enterprises - sob stories are not a business model. He said: "The simple truth is that it is difficult for a social enterprise to survive if it can only motivate customers to make one-off purchases out of pity." The raiSE survey also found that Singaporeans are more discerning and less moved by philanthropic motivation. More buyers also look out for quality and uniqueness when choosing a product from a social enterprise, with 35 per cent considering quality to be a factor in buying decisions. The social enterprises, too, are seeing customers who buy their products for a simple reason - they like the product. Project Nomad's Mr Haziq Rashid said: "I think there is a fair representation of both groups. Some have told us they really like the quality of our vintage leather." Eden + Elie's Ms Stephanie Choo added: "In our first year, we did not communicate our social story publicly, (so) our customers did not know it when they purchased our jewellery at the time." Mr Chang, who has experience with giving both advice and funding to social enterprises, is starting to see more well-developed and targeted products and services from social enterprises. "Partially, investors (also) demand that social entrepreneurs focus on product quality because that makes the business competitive and scalable." Internationally, there is nonprofit organisation B Lab, which accredits companies that meet the highest standards of verified, overall social and environmental performance, public transparency, and legal accountability with B Corp.
Companies that have received B Corp status include Etsy and Ben & Jerry's. Ms Pamela Chng, from Bettr Barista Coffee Academy, which is B Corp certified, said she has been approached by new and existing companies asking how to be a social enterprise. She added: "It is good that people are recognising this business model, but if their purposes are not authentic it would not be good for the rest of us. "Some customers would not be able to discern the difference and might feel cheated."